2. Offices. The principal office of the council shall be in the Johnston County Visitors Bureau offices located 234 Venture Drive, Smithfield, NC 27577. 2. Term of Office. The eight members of the Committee as designated above representing the Parks & Recreation Departments, the JCTA Board, JCVB Executive Director and County Commissioner appointee shall serve as permanent members of this committee. 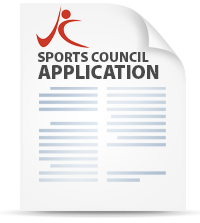 The seven at-large sports council appointees shall serve three year terms, and are eligible for two three year terms. The intention of the council is to have seven at-large members to represent the seven voting districts of Johnston County. All efforts will be made to have each area of the county represented. As the terms of the initial members of the Committee shall expire, their successors shall be appointed for three-year terms. Each member of the Committee shall serve until his successor is duly appointed as above provided. Terms shall be effective November 1st of each year. 3. Resignation. Any appointed member may resign at any time by giving written notice of such resignation to the Johnston County Tourism Authority. 4. Vacancies. Any vacancy in the Committee occurring during the year may be filled for the unexpired portion of the term by the appointment of the Johnston County Tourism Authority. Any Committee member so appointed shall serve the unexpired term of a Committee member he is replacing. 5. Regular Meetings. The regular meeting of the Committee shall be held at the offices of the Johnston County Visitors Bureau on the 3rd Wednesday of each odd numbered month for the purpose of any business. 6. Special Meetings. Special meetings of the Committee may be called with 48 hour written request. 7. Notice of Meetings. Written or printed notice stating the time and place of the meeting shall be delivered not less than two nor more than ten days before the date thereof, either personally or by mail, to each Committee member. In the case of a special meeting, the notice of meeting shall specifically state the purpose or purposes for which the meeting is called. The “N.C. Open Meetings Law” G.S.143-318.10 applies to this Committee. 8. Chairman. At all meetings of the Committee the Chairman, or Vice Chairman, or in their absence a Chairman chosen by the Committee members present, shall preside. 9. Quorum. At any meeting of the Committee the presence of 50% + 1 of the Committee members in person shall be necessary to constitute a quorum for all purposes except as otherwise provided by law, and the act of a majority of the Committee members present at any meeting at which there is a quorum shall be the act of the full Committee. At any meeting at which a quorum shall be present any business may be transacted which might have been transacted at the meeting as originally notified. 10. Compensation. Committee members shall not receive any stated salary for their services as such, but actual expenses of service may be reimbursed. 11. Removal of Committee Members or Officers. Any Committee member or officer may be removed from office by the affirmative vote of a majority of the Johnston County Tourism Authority, at any regular or special meeting called for that purpose, for conduct detrimental to the interests of the Committee. 12. Powers. The Johnston County Sports Council shall be an advisory body to the Johnston County Visitors Bureau, which by legislation established in 1987 is the official tourism marketing organization for the county of Johnston. c) Attend sports-related tradeshows through the JCVB membership with the NC Sports Association and conduct follow-up sales calls and/or prepare bids/proposals to attract tournaments to Johnston County. d) The Johnston County Visitors Bureau will provide in-house design services for brochures and website, and staff time to distribute brochures throughout the county and via statewide Visitor and Welcome Center contacts. 1. Number. The officers of the Committee shall consist of a Chairman and a Vice Chairman. 2. Election, Term of Office, and Qualifications. The Officers shall be elected annually at the first meeting of each calendar year by the members of the Committee from among their number. 3. Vacancies. In case any office of the Committee becomes vacant by death, resignation, retirement, disqualification, or any other cause, the majority of the Committee then in office, may elect an officer to fill such vacancy, and the officer so elected shall hold office and serve until the next annual election of the Officers and until the election and qualification of his successor. 4. Chairman. The Chairman shall preside at all meetings of the Committee. He shall have and exercise general charge and supervision of the affairs of the Committee and shall do and perform such other duties as may be assigned to him by the Committee. 5. Vice Chairman. The Vice Chairman shall in the absence or disability of the Chairman, perform the duties and exercise the powers of that office. 6. Removal. Any officer may be removed from office by the affirmative vote of two-thirds of all the Committee members at any regular or special meeting called for that purpose, for nonfeasance, malfeasance, or misfeasance, or conduct detrimental to the interests of the Committee, or for refusal to render reasonable assistance in carrying out its purposes. Any officer proposed to be removed shall be entitled to at least five (5) days’ notice in writing by mail of the meeting of the Committee at which such removal is to be voted upon and shall be entitled to appear before and be heard by the Committee at such meeting. The fiscal year of the Committee shall begin July 1st. The Committee will operate under such budget, if any, as may from time to time be established by the annual budget ordinance of the Johnston County Tourism Authority, but an expenditure there from shall be made only upon approval of the Executive Director and in accordance with ordinance and statutory requirements. ADOPTED THIS 11th DAY OF November, 2015, by the Johnston County Tourism Authority.